For the first time, Jacksonville will play host to a global FinTech innovation challenge. On Feb. 6-7, Global Accelerated Ventures, in collaboration with FIS, will bring more than 1,000 FinTech industry professionals to Jacksonville to attend GAV’s inaugural Global FinTech Innovation Challenge. The Global FinTech Innovation Challenge will bring together 25 of the best and brightest of the startup community addressing five challenge areas: blockchain, data analytics, process automation, banking innovation, and payments innovation. The winner from each category will receive a cash prize and advance to the grand finale for the honor of being named GAV’s ‘FinTech Startup of the Year’ and the chance to win more cash prizes up to USD 100k. With the support of local Jacksonville based companies, including FIS, the event will bring financial and technology professionals from the local Florida community together with those from other FinTech markets around the world, including Croatia, France, Israel, Italy, Romania, Singapore, UK, US and more. GAV’s Global FinTech Innovation Challenge goes beyond just pitches and presentations and will feature keynote and panel sessions with leading industry players. 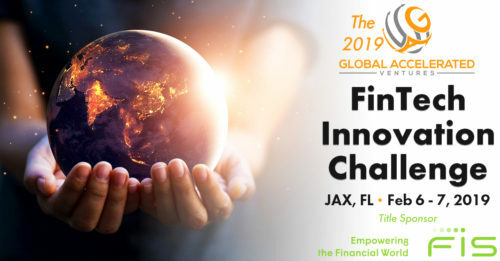 FIS Chief Product Officer Bob Legters will open GAV’s 2019 FinTech Innovation Challenge with a keynote session highlighting the latest innovation trends that are reshaping the payments industry. Additional panel sessions covering blockchain in capital markets, innovation in banking and harnessing the power of AI will follow across the two days. As a participant, competing startups will get free exhibition space; access to senior leaders from top industry brands, such as FIS, InterSystems, BNP Paribas, London Stock Exchange and more; networking opportunities with like-minded professionals; and constructive feedback from judges to enhance solution offerings. Click here for more information.